The most commonly seen is the Blue Monkey and in fact it is the only species that I saw within the park. When hiking the Marangu route the forest between the gate and Mandara huts should produce two or three groups of these. Acording to the literature they travel in groups of 10 to 40 animals. They are relatively small, 4 to 6 kg in weight and are an arboreal, diurnal monkey. When we did find them they were in trees and on the ground. They were not particularly shy of us and were quite close to the trail. If you are not paying attention or the monkeys are quiet you could easily miss them in the heavy growth of the forest. They feed mostly on fruit and leaves but will eat invertebrates such as slugs. They are dependent upon humid, shaded areas with abundant water and tall trees, (hmmm that pretty much describes the forest around Kili) providing food and shelter. They are preyed upon by leopards, snakes and some birds of prey. The troop is made up of an alpha male and his females and young. The photo below was taken by Ray on our descent through the forest zone. 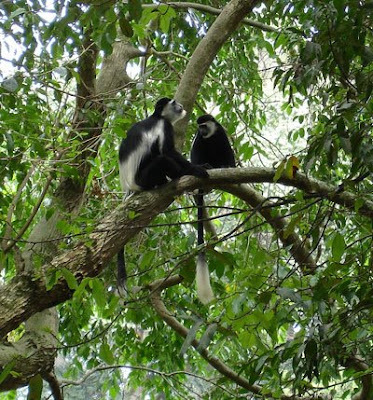 The next most commonly seen is the Black and White Colubus Monkey. Colubus's are a very arboreal species of monkey that are rarely seen on the ground. Kilimanjaro has its own subspecies, the Kilimanjaro Black and White Colubus, which is distinguishable by its tail being completely white. This variety is also seen on Mt Meru and some areas immediately surrounding the two mountains. I did not see this species as it is quite scarce along the Marangu route. Apparently as I learned after our climb the only place to see it on the Marangu route is at the Maundi Crater, a cinder cone near the Mandara Huts. As you will note in my post Gate to Mandara Hut I wimped out, and learned a lesson albeit later, when I never saw a Colubus. According to the literature the Colubus is fairly common on Kilimanjaro but varies in abundance, being most common on the north and west slopes, where "very dense populations occur" and rarest on the southern slopes. The Colubus is a large black monkey with a white mantle. The tail is longer than the body and in the case of the Kilimanjaro subspecies it is entirely white. The photo below is not from the Kili subspecies. The males weigh from 9 to 13 kg, females 8 to 9 kg. The Black and White Colubus is found in a variety of habitats all across the centre of Africa. It has at least 7 different subspecies, including the Kilimanjaro one. Colubus' feed mainly on leaves and fruit but, as might be expected with an animal found in a variety of habitats, its diet can be variable. 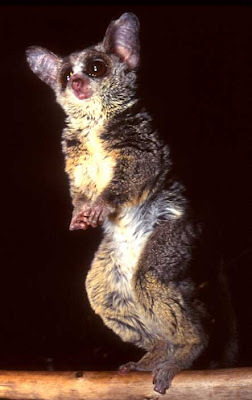 The third species of primate found on Kilimanjaro is a Galago or Bushbaby. These small, nocturnal primates are not well known and are subject to a lot of taxanomic work. There is considerable debate in the literature over which species are where and which are true species. 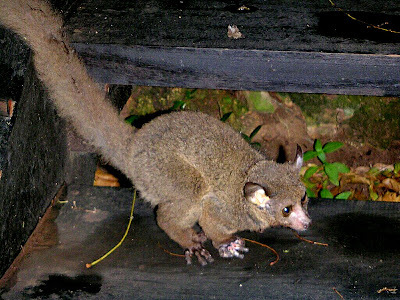 They are called bushbabies because of the "crying" noises they make at night. I didn't see any of these but as I said in an earlier post, if I went back I would be tempted to walk into the forest at night with some lights, and look for eyeshine. These photos are of Otolemur sp. but probably not the Kili species. I found these on the web. They are not my photos.